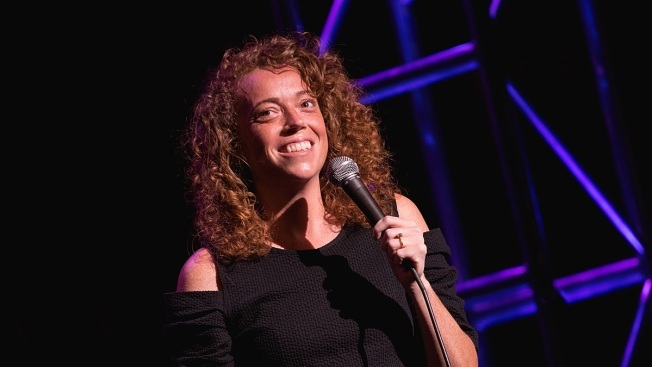 Comedian Michelle Wolf performs onstage during the Moontower Comedy Festival at The Paramount Theatre on April 21, 2017 in Austin, Texas. White House aides, reporters and other famous-for-Washington types gathered without President Donald Trump to toast press freedom. It was the second White House Correspondents' Association dinner in a row without the president. Instead of attending, Trump held a Saturday evening rally in Michigan with his "favorite deplorables" — a term that Democrat Hillary Clinton used in 2016 to describe some of Trump's campaign supporters. The Washington dinner, which once attracted Oscar winners and buzzed-about stars, came as Trump routinely slams reporters as dishonest and their work as "fake news." Comedian Michelle Wolf delivered what's usually a roast of the president and the press. She opened the set with jabs at Trump's wealth and alleged affair with adult film actress Stormy Daniels. But the president wasn't the only target of her jokes. "I'm just here to make jokes, I don't have an agenda, I don't expect to get anything done, so members of Congress should feel right at home," she cracked. "I like making fun of people to their face ... more than behind their backs, so it would have been more fun" if Trump were in the audience, Wolf told CBS' "This Morning Saturday" ahead of the big event. "None of my jokes changed. It's just nicer to make fun of them when they're there. I think it's cowardly not to go." Trump's aides skipped last year's dinner, when some accompanied Trump to a rally in Pennsylvania where he celebrated his 100th day in office. This year, however, even with Trump out of town, many White House aides were expected to hobnob with the journalists who cover them. In 2017, Trump became the first president to skip the event since Ronald Reagan in 1981; Reagan was recovering from an assassination attempt.